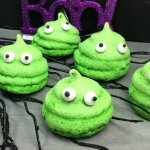 Spooky Slime Cookies - the Slime Recipe You're SUPPOSED to Eat! Inside: Bright green slime cookies that are perfect for Halloween or anytime for your favorite slime fanatics! A slime recipe you’re supposed to eat! We love slime!! While we make lots of taste-safe slime recipes to play with, you definitely wouldn’t want to eat the whole batch. That’s why I’m super excited about these bright green slime cookies! 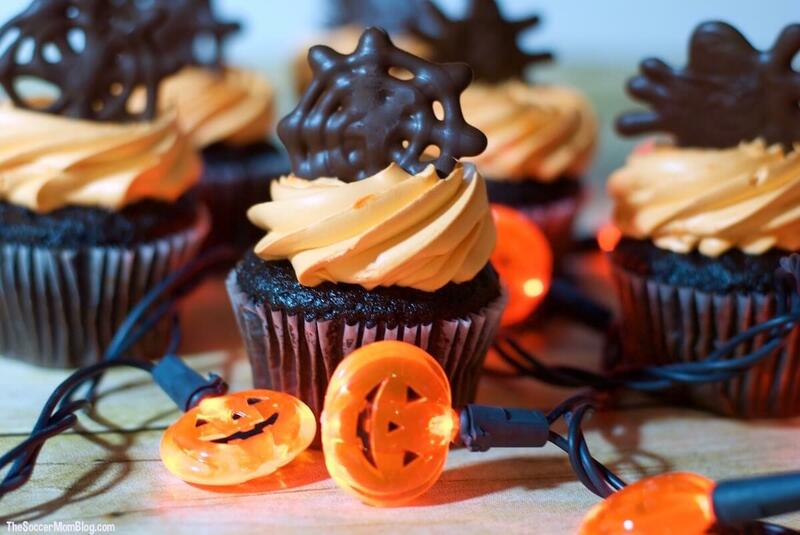 These spooky slime cookies are the perfect Halloween party snack for kids OR anytime treat for your little slime fans. Our bright green Slime Meringues would even be perfect for a slime-themed birthday party with slime gift baskets and slime making activities and decorations! I’ve included affiliate links for your convenience in re-creating this recipe; disclosure policy here. Keep reading for photo step-by-step instructions and prep tips! Recipe demo video and free printable copy of our Slime Cookies recipe is available at the bottom of the post. Meanwhile, in a standing mixer, combine the egg whites and cream of tartar. Mix until frothy. Continue to mix on medium-low speed, adding sugar slowly, alternating between the two types of sugar, 1 Tablespoon at a time. Your final Tablespoon should end up being powdered sugar. Add food coloring slowly, 1-2 drops at a time, until you achieve your desired shade. It’s easy to add more food coloring, but impossible to make them lighter if you add to much at once! 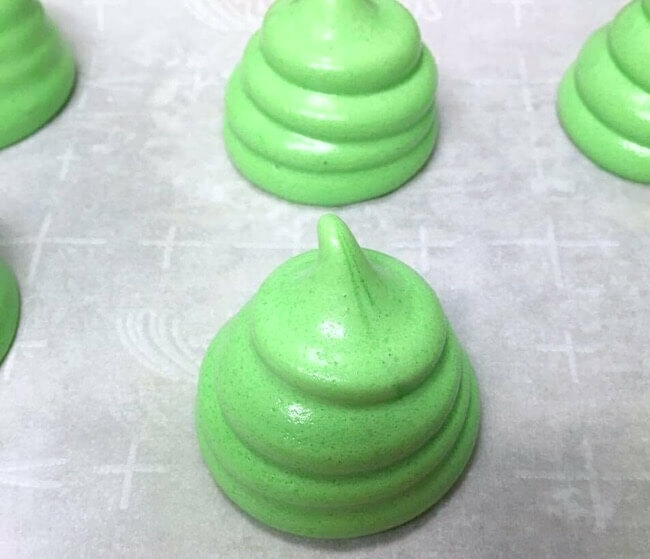 TIP: We used a piping bag to make our slime meringues, but in a pinch you could use a ziplock bag with the corner cut off. Note: Don’t forget to save leftover meringue to use later to “glue” your edible eyes to the cookies! Wait until slime cookies are cool before attaching edible eyeballs with the meringue you kept aside. 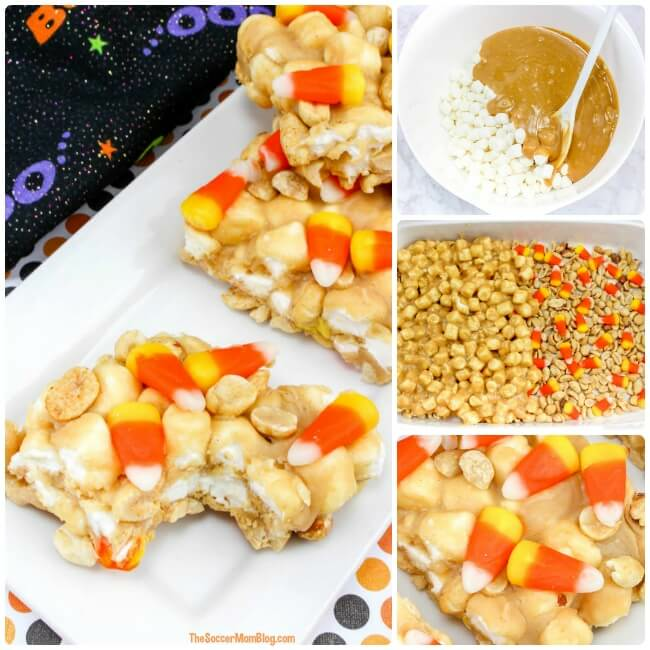 Grab a printable copy of this recipe below! *Taste-safe sensory play activities not meant for consumption. If you love this slime cookies recipe, rate it! 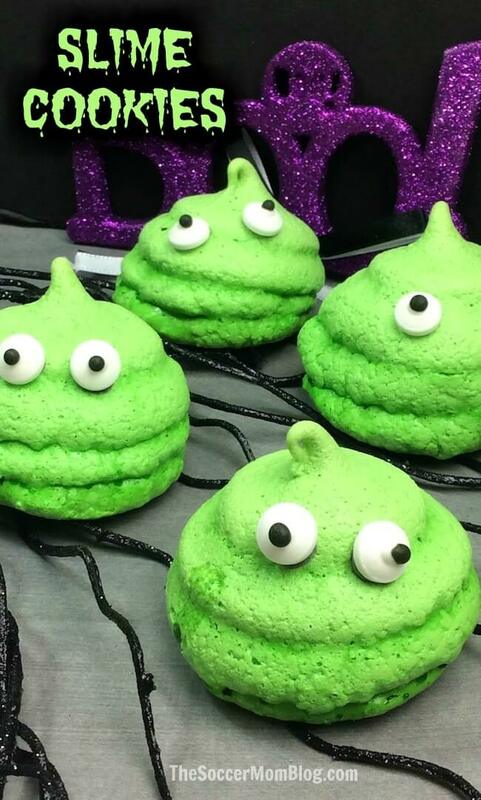 These spooky slime cookies are the perfect for slime themed birthday parties or Halloween! Click for video tutorial! Add leaf green gel food color, 1-2 drops at a time, until you achieve your desired shade. Scoop meringue into the piping bag and pipe dollops of the meringue on top of each other. Keep leftover meringue to use later to "glue" your edible eyes to the cookies. Bake for 1 hour and 25 minutes at 225°F. Once your slime monsters are done baking, remove from oven and allow to cool enough to handle. 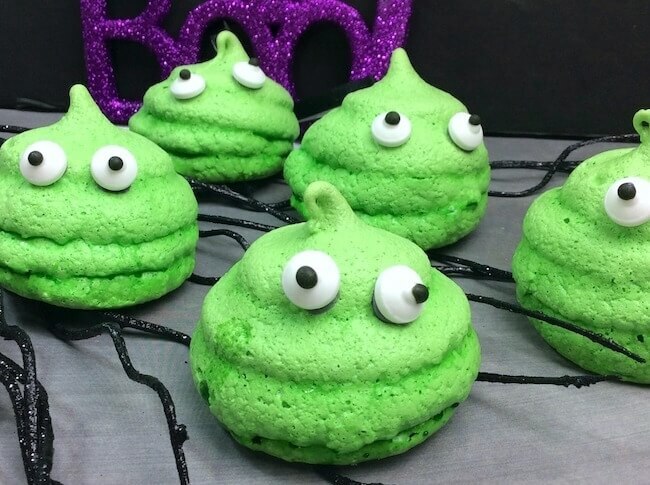 Use the remaining meringue you set aside earlier to attach edible eyes to the slime cookies. *Nutritional information does not contain edible eyeballs! 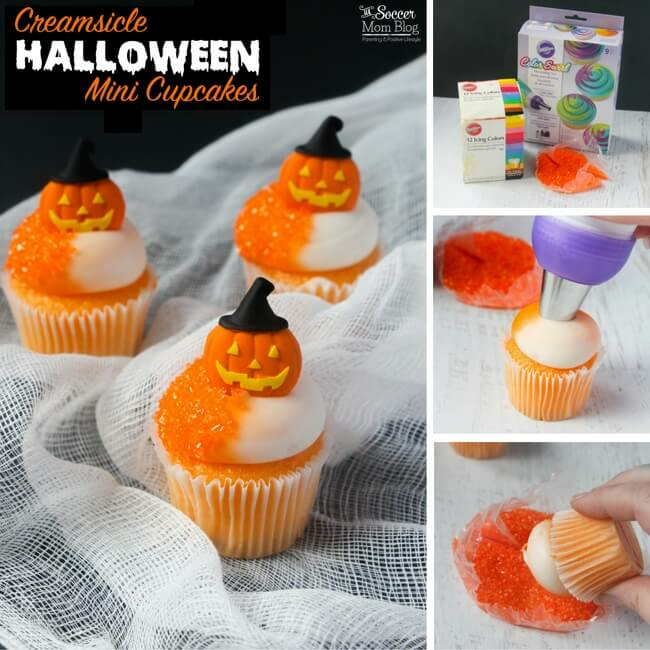 Tip: if you don’t have green food coloring on hand, try making these ghost meringues from our friends at Sugar Spice & Glitter! Just curious do these need to be stored in the refrigerator? And how long do they keep? A couple of days? Thank you for the recipe, they are super cute. Hi Jessica – they should be fine for about a week or so if keep in an airtight container. If you live in a humid area, you might want to try to use them sooner. Hope this helps! When does the 1 teaspoon vanilla get added? 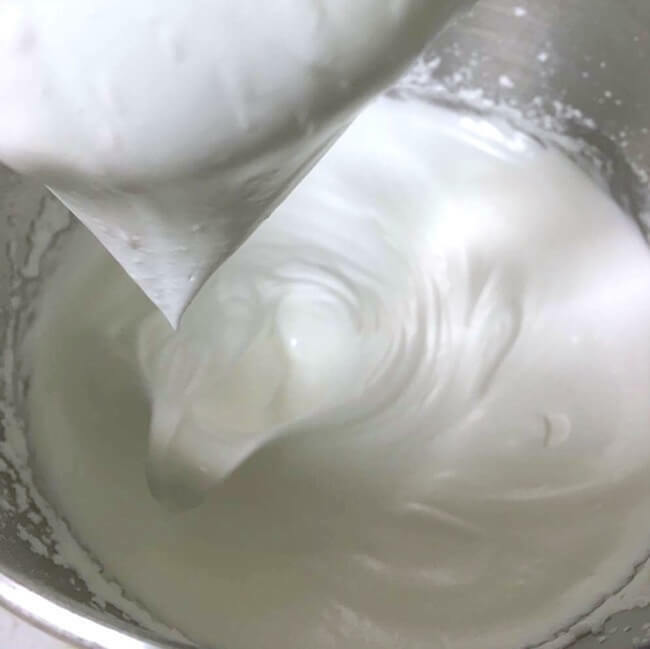 Hi Rachel – You can add the vanilla after you mix the egg whites and cream of tartar. The recipe will taste just fine without it, but I think the vanilla adds a little more depth of flavor. I’ll update the recipe to make it clearer – thanks! 1) How long does the recipe bake? Inside the instructions it says it bakes for 1 hour and 25 minutes, but at the top of the instructions it says it only bakes 15 minutes. 2) When is the right time to put on the eyes? Your instructions say after they’re done baking, but your video shows before they’re done baking. Hi Megan – you can add the eyeballs either before or after baking. The correct baking time is 1 hour and 25 minutes. I must have left off the “1” when I typed up the recipe card, but I fixed it. Thanks for letting me know! For some reason my stiff peaks aren’t forming?! I followed everything exactly. Does it take awhile? Hi Jessica – they won’t be completely “stiff” to the touch, but should hold their shape at least enough to form your cookies on a sheet. Without seeing exactly what you did it’s hard for me to troubleshoot from afar, but I’m happy to try!